Judges for the 2017 Art Awards were Lynda Tyler (Auckland) and Denise Copland (Dunedin). Finalists work for the 2017 Arts Gold Awards was exhibited at Central Stories Museum and Art Gallery in Alexandra. Click HERE to see images of the finalists work. 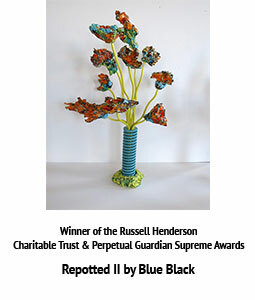 The Russell Henderson Charitable Trust and Perpetual Guardian Supreme Award; Dunedin artist Blue Black, ceramic work, Repotted II. 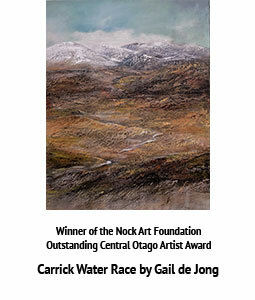 The Nook Foundation outstanding Central Otago Artist Award; Bannockburn artist Gail de Jong, oil on canvas, Carrick Water Race. 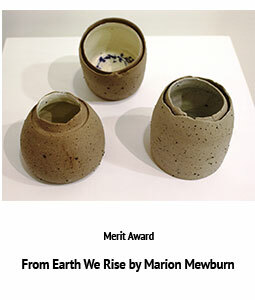 Merit Award; Teviot Valley artist Marion Mewburn, double-vesselled clay and dirt pots, From Earth we Rise. 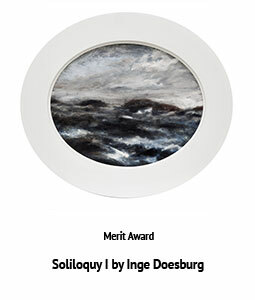 Merit Award; Dunedin artist Inge Doesburg, oil on gesso, Soliloquy I.